This title features 50 exquisite recipes, that are shown in 200 beautiful photographs. 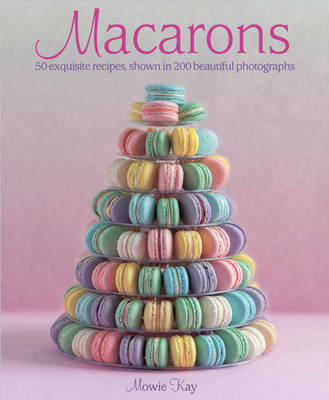 You can create professional-looking macarons in your own kitchen with this sensational new book. It offers a comprehensive introduction that covers all the basics to get you started, including an overview of ingredients, equipment and techniques. 50 recipes cover all the classics, such as pistachio, lemon, rose and chocolate, as well as plenty of innovative recipes, such as salted caramel, raspberry and white chocolate, macadamia and champagne, and peanut butter and jelly. Clear step-by-step instructions and inspiring photography make it easy to achieve success. It is packed with tips and variations to help you make the most out of every recipe. Nutritional notes are included throughout. Elegant and sophisticated, macarons are a delight for the eye as well as the tastebuds. They usually adorn the window displays of French bakeries, but with this book you can create these stunning morsels at home. Mowie Kay has developed 50 recipes that are suitable for every occasion. They come in a delightful array of vibrant and pastel shades, and make use of a wide range of ingredients. You can try classic recipes, such as vanilla or espresso macarons, or opt for something new, such as strawberry and balsamic vinegar macarons. With over 200 glorious photographs, including a picture of every finished dish, this is the perfect addition to every baker's bookshelf.